Lecture: "What Unites the 'Uniates'? 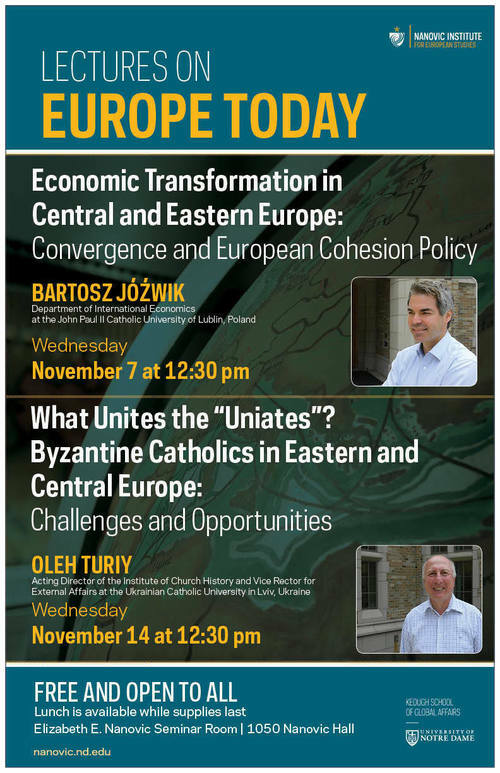 Byzantine Catholics in Eastern and Central Europe: Challenges and Opportunities"
Nanovic Visiting Scholar Oleh Turiy from the Ukrainian Catholic University of Lviv, Ukraine, will deliver a lunchtime lecture. The event is free and open to all. Lunch is provided while supplies last. Dr. Oleh Turiy is the Acting Director of the Institute of Church History and Vice Rector for External Affairs at Ukrainian Catholic University in Lviv, Ukraine. Born in 1964, Dr. Turiy was one of the first historians in post-Soviet Ukraine to present a dissertation on the history of the Church in Ukraine. His dissertation (1994) focused on the long-term consequences of the Union of Brest (1596), which brought Eastern Orthodox parishes in the Polish-Lithuanian Commonwealth into communion with Rome. At Notre Dame for the fall semester, Dr. Turiy will be working toward his Advanced Doctorate (the highest government-recognized degree in Ukraine), extending his earlier research by comparing it to the complicated histories of the Church in other countries of central and eastern Europe. Widely-published and awarded a papal decoration of honor for his work, Dr. Turiy is fluent in Ukrainian, German, Polish, Russian, and English.